I got a free copy of PEBL, psych experiment software, which includes a couple of standard working memory tests. What cognitive functions do more complex rehearsal and chunking techniques tap into? Is there a means to improve / train those specific cognitive functions? Chunking leverages long-term memory for the chunks, i.e. we recognize and remember much easier the familiar chunks, sometimes algorithmically. This is much easier explained in the domain of letters/words, e.g. we'd recognize USA as substring among random letters. Similarly most would recognize the pattern 1945 (WWII end) by paired association, or 12321 algorithmically. In the classic case of SF he used sequences familiar to him (running times) to greatly improve his performance. More unusual (cf. Memory Search By A Memorist) is Rajan's ability to recognize 13- to 17-digit chunks visually/syntactically, without assigning them meaning. Ishihara, who could memorize overall longer sequences than Rajan [under controlled settings], but was much slower, used a method to convert them into syllables; he was naturally very gifted at remembering nonsense syllables though (cf. Superior Memory). A few other association methods exist, including with places ("loci"), which relies on visual memory etc. It's possible to train the average person using these and attain significant improvements; the graph below (3rd one bein relevant, but I've included all for the caption) is from a recent PhD thesis. It takes a significant amount of practice/time to become proficient/fast in the encoding/decoding techniques. The other two tests are self-paced (just with overall time limit) memorization tests, i.e. how many words/digits in a sequence can be retained in a 5-minute interval with no time pressure for learning each word/digit. The digit span was tested with 2 second intervals, which probably helped with learning a bit. Other authors have used 1 second, which makes it harder to apply encoding/decoding techniques. 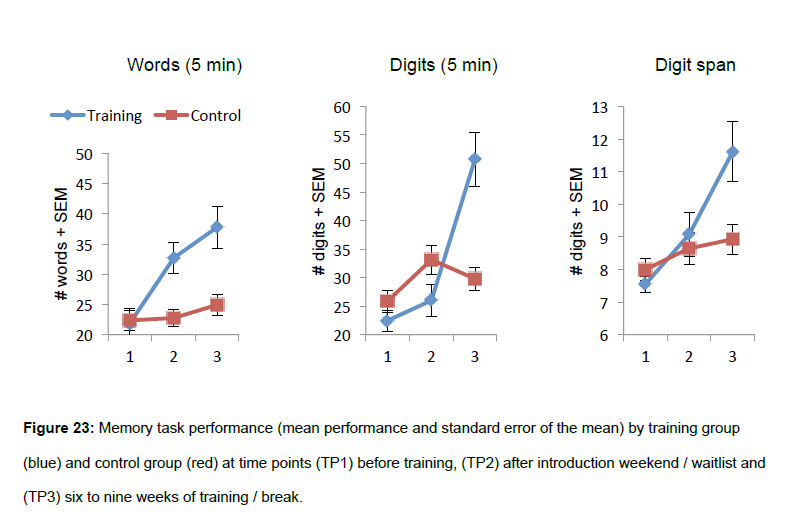 The training protocol (for the blue lines) was fairly involved using the Memocamp software which can display the memorization aids (loci or images), and can also display a configurable metronome. "SEM" stands for "Standard Error of the Means (the error bars). The handful of people (not in this thesis/experiment) who have practiced for years (one of SF's colleagues and two in a replication experiment) have reached 80-100 digits in the digit span test. For that level of performance, not only did they use an associative system, but also a hierarchical chunking method. The chunk size was almost universally 4 for these performers (thus the need for hierarchy). On average it took about 500 hours of practice to decrease decoding/encoding time from an initial 5 seconds to the 1 second required by the digit span test (all this cf. The Neuroscience of Expertise, pp. 110-112). Not the answer you're looking for? Browse other questions tagged experimental-psychology working-memory brain-training psychophysics executive-function or ask your own question. Does the digit span test draw on any executive functions besides working memory, if “chunking” is not used? What to call measures obtained between pre-test and post-test?